Welcome to the Society of American Florists! SAF membership is open to all individuals and companies in the floral industry. Learn more about joining SAF here. Founded: Chartered by an act of Congress in 1884, the Society of American Florists was formed in Chicago, IL by 21 members of the American Association of Nurserymen, Florists and Seedsmen. Chartered by an Act of Congress in 1884, the Society of American Florists was formed in Chicago by 21 members of the American Association of Nurserymen, Florists and Seedsmen. They created the new organization to provide hail insurance for members. They mailed invitations to florists across the country. Annual dues were two dollars. In the same year, the Statue of Liberty arrived from France. By the next year, SAF had 400 members and hail insurance was still the hot agenda item and remained so for the next few years. Ironically, the first person to collect was the first person that joined. He signed up begrudgingly because he was the member farthest from the hail belt. national flower, an event that was finally to take place nearly 100 years later. The value of educating children about the value of flowers and plants was the focus of SAF in 1892. That year, an auxiliary group of SAF, the Florists’ International Telegraph Delivery Association reported an income of $1,641.94. As the decade moved toward the turn of the century, the industry survived a severe depression. Members complained about a new wave of competitors as department stores began selling flowers and plants. In 1897 Florists Review magazine published its first issue. By 1900, SAF’s membership hit 533 and the convention featured a trade show. The most popular convention activity? It was bowling. The following year, the year he was assassinated, President McKinley signed the SAF national charter. The early 1900s were years of growth for SAF. In 1910, Florists Telegraph Delivery was developed further with the new goal of helping retailers expand their business. Mother’s Day became an official holiday in 1914, and by the following year, SAF members met with the founders of Mother’s Day to see how the floral industry could promote the occasion. In 1922, King Tut’s tomb was opened to reveal what it thought to be the first evidence of almost perfectly preserved funeral flowers. In 1924, SAF began a $1 million advertising campaign for “Say It With Flowers.” A national survey showed Easter the number one floral holiday — 80% of the florists said so. Three years later, in 1927, SAF upped their promotional budget to $2 million. The national arboretum in Washington was established and Lindbergh flew across the ocean. By the mid 1930s, the depression had ended the advertising campaign, but greenhouse expansion indicated florists fared better than other businesses. Teleflora was founded and ankle corsages were the rage. 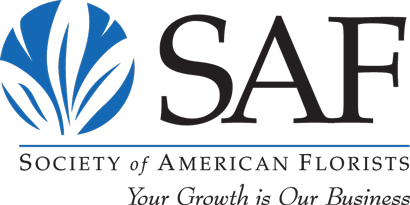 SAF moved to Chicago and conducted its first major reorganization to better meet the needs of members. An attempt to organize a national growers’ association failed. In the 1940s, wartime again affected the industry. Flowers could not be delivered in rubber-tired vehicles. SAF pitched in on the Victory Gardens program and received a national commendation. By the end of the war, advances in air transportation and the return of servicemen in Hawaii introduced tropical flowers to the mainland. And SAF learned that after years of effort, a special census of horticulture would be included in the 1950 agricultural census. The 1950s saw “in lieu of flowers” become a nationwide problem. One of SAF’s committees, the Florist Information Committee, won a national public relations award for its efforts to deal with the problem. In 1955, SAF worked to eliminate transportation damages which could have resulted in costly litigation, and in 1957 SAF moved its headquarters from Chicago to Washington, D.C.
Three of SAF’s most important and enduring honors were born in the 1960s. The Floriculture Hall of Fame was founded in 1962, the American Academy of Floriculture in 1965 and the Professional Floral Commentators-International in 1967. In 1969, the American Floral Marketing Council (AFMC) was created. AFMC evolved from earlier promotional groups, and would become the one of the nation’s largest voluntarily funded marketing program. SAF organized itself based on divisions of membership, including retailer, wholesalers and grower, by the early 1970s. SAF’s political action committee, SAFPAC, was formed to make legal contributions to elected representatives who support the industry. Three new wire services, AFS, Florafax and Redbook were founded. 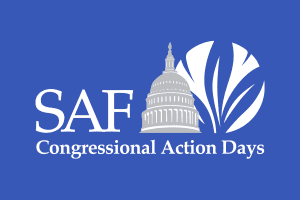 SAF’s first annual Congressional Action Days was held in Washington in 1980. U.S. growers voted “no” to Floraboard, a national promotional campaign. In 1984, SAF celebrated its 100 year anniversary. That year, after several years of industry fundraising, SAF moved into its own building in Alexandria, VA. The following year, 1985, 20 years after the start of the women’s movement, AFMC determined that the fastest-growing Valentine trend was — women giving flowers to men. By the end of the decade, the idea of a nationwide mandatory promotion effort was revived, fine-tuned and called PromoFlor. And FIC won another first place award — nearly 40 years after the first one — again, for its “in lieu of” efforts. The decade of the 90s began with events that were no less historic than any of the others — SAF paid off the mortgage and burned the note. The Floral Legislative Action Group, or FLAG, a grassroots lobbying effort, was activated. First Lady Barbara Bush was inducted into AAF. Demonstrating a great spirit of unity, in 1993 the industry joined to spearhead the passage of PromoFlor through Congress, the first step to realizing earlier dreams of a national promotion effort. Congressional awareness of our industry increased again as the Agricultural Appropriations Bill cited floriculture as a target for increased research funding. In 1994, PromoFlor was signed into law and the industry was one step closer to a ten-million-dollar advertising camp SAF made the education of care and handling a priority with a newly-updated manual that was met with rave reviews. SAF’s Floral Management Magazine named its first-ever Marketer of the Year. And the entire association was thrilled that 95.8% of SAFPAC candidates were election winners. In the wake of the tragic 1995 Oklahoma City bombing, SAF provided crisis response expertise and assistance as the industry selflessly donated flowers to help bring a little comfort to the hundreds of grieving families and rescue workers. And flowers were revitalized as a national symbol of hope. In 1996, PromoFlor got off the ground running with a series of new television commercials that featured a bee named “Buzz” that encouraged consumers to “Think Flowers.” And once consumers were reminded to buy flowers, SAF was there to drive those sales to professional florists through targeted national advertising, a dynamic public relations program and a wealth of local marketing materials. Also in 1996, SAF and AFMC consolidated memberships giving all members the valuable benefits of both organizations rolled into one flat dues structure. As a result, SAF members looked forward to more than a dozen cutting-edge new products and services. In the last few years of the 20th Century, SAF clearly entered the “Information Age.” As the marketplace continued to be competitive and consumer spending controlled by shifts in the economy, SAF was there to provide the most timely statistics, trends and sales figures. SAF created a new Research and Information Department staffed with a full-time statistical expert who can produce customized data reports for SAF members. It was during the 1990s that the information superhighway carved a path through U.S. business and SAF made sure its members had valuable resources at the click of computer mouse. The SAF Web site www.safnow.org launched to provide industry news and links to online services available exclusively to SAF members. On the consumer side, www.aboutflowers.com was developed to remind would-be flower buyers about the services provided by professional florists as well as care and handling tips. With guidance from its strong volunteer leadership, SAF headed into the 21st Century with bright prospects based on a proud history. In January 2001, more than 150 industry volunteers donated more than 5,000 “man hours” and more than 150,000 flowers and other products to the Presidential Inauguration floral team through SAF. Their creativity and commitment made the Bush-Cheney Inauguration a beautiful, memorable experience. The floral arrangements for this national celebration proved how flowers are significant and necessary for special events, and more importantly, showcased amazing talent and the natural beauty of flowers. News coverage about the floral preparations flooded the airwaves and newspaper in the week prior to the Inauguration. Increased competition for consumer dollars means the industry needs to promote flowers as the gift of choice more than ever. Working toward this goal, the SAF Fund for Nationwide Public Relations, an industry-wide voluntary promotion fund, was launched in March 2001. The goal of the fund is to raise $2 million to $4 million annually for innovative public relations programs to generate valuable news coverage. Those dollars can go a long way toward getting the word about flowers and florists in the news. Due in part to SAF and its members’ grassroots efforts, employers are no longer required to comply with the Occupational Safety and Health Administration’s (OSHA) ergonomics standard; its compliance deadline was to begin Oct. 15, 2001. The U.S. Senate passed a Resolution of Disapproval to overturn OSHA’s ergonomics rule and the U.S. House of Representatives followed suit. The proposed OSHA ergonomics regulation would have burdened small business disproportionately. SAF also launched the use of a tag line or slogan in the spring on 2001. “Your Growth is Our Business” says a lot about SAF and what we do for members. The tag line positions SAF, helping the floral industry make an instant connection to SAF benefits and value. To more accurately reflect the current state of the field of floral commentary, Professional Floral Commentators – International (PFCI) has officially changed its name to “Professional Floral Communicators – International.” Dedicated to the improvement of professional communication for the floral industry, PFCI is the organization that exemplifies leadership, expertise and commitment to personal and industry growth through continuing education. The third edition of “The Changing Floriculture Industry” report was released in 2001. It is the most complete statistical overview of the industry available anywhere, tracking industry sales, production levels and trends for each industry segment over the past 30 years. In the fall of 2001, the floral industry tried its best to help comfort and raise the spirits of those connected to the Sept. 11 terrorist attacks on the World Trade Center and the Pentagon. Industry organizations worked together to help heal the hearts of the victims and their families and rescue and relief workers. The Society of American Florists (SAF), working with FTD, Teleflora, the American Institute of Floral Designers (AIFD) and other industry organizations, coordinated the efforts, providing flowers for weeks following the tragic events. SAF’s consumer Web site www.aboutflowers.com received a “face lift” in 2001. The site offers floral advice and promotes the professional florist.Forget the fountain of youth; new scientific research proves flowers help senior citizens cope with the challenges of aging. The evidence comes from a six-month behavioral study for which the Society of American Florists (SAF) partnered with Rutgers, The State University of New Jersey, to explore what effect flowers would have on senior citizens. SAF’s 2001 Flowers & Seniors Study demonstrates that flowers ease depression, encourage social networking and refresh memory as we age. The research is being promoted through a strategic public relations campaign to generate print and broadcast stories nationwide. As SAF moved further into the first decade of the 2000’s, perhaps the biggest impact on SAF and its members was from technology. Technology has changed cthe way the industry does business, and SAF adopted new and unique communications technologies to reach its members. E-mail became the preferred mode of communication for many people. SAF capitalized on this shift in 2004, when it introduced its weekly e-mailed newsletter, E-Brief. It soon became a well respected source for news and information and generated rave reviews from SAF members. In particular, members like the timeliness and practicality of the articles and also find the links in the stories immensely valuable to their business. E-Brief became a very valuable benefit of belonging to SAF. 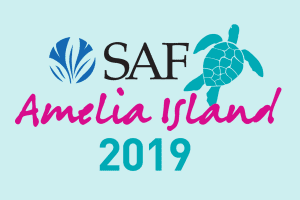 Further capitalizing on the trend toward more e-mail communication, SAF, during the mid-2000’s, made a conscious effort to promote attendance at events through e-mail marketing and also made it easy for members to register for events online. In addition, e-mail made its way into SAF lobbying campaigns. By going to SAF’s Web site, members could access and send grassroots letters to their Members of Congress on issues that are important to them. Also, SAF used the power and speed of e-mail to distribute Action Alerts to SAF members. 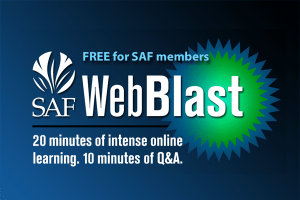 In 2006, SAF completely revamped its member Web site. Not only was the graphic look updated and modernized, but many new features were added that allowed members quicker and easier access to information. A search engine made it possible to find literally anything on the site, and discussion forums gave members a chance to exchange ideas and opinions on a wide range of industry and business topics. In the government relations arena, SAF spent a considerable amount of time and resources on the issue of comprehensive immigration reform. SAF was an active member of the Agricultural Coalition on Immigration Reform and lobbied aggressively to ensure that the industry had the labor it needed to produce flowers and plants for the American consumer. Additionally, Congressional Action days had its 25th Anniversary in 2005. It continues to be an effective tool to educate Member of Congress about the floral industry and SAF members about how things work on Capitol Hill. 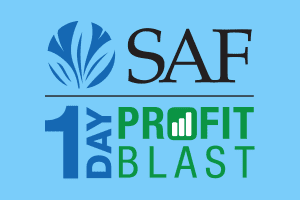 SAF’s Nationwide Fund for Public Relations continued to generate tremendous visibility for the floral industry in the print and broadcast media. SAF’s Flower Power Workshops, held in 2006, strengthened relationships with key national news media. A collaboration with Home and Garden TV’s national organizational expert Vick Norris helped SAF integrate floral messages in advice on organizing and keeping a well-balanced home. Also, SAF completed a major research study on Consumer Attitudes and Behavior about floral purchasing in 2005. The study provided valuable information about why people buy – or don’t buy – flowers and plants. In 2009 SAF celebrated it’s 125th Anniversary.